I could have done without a few of the extended scenes of general mayhem that exhibited themselves a few times in the film. There was one scene towards the end of the film (or what I thought was the end of the film) that seems gratuitous. Not in a “yuck, this is gross” kind of way but in more of a “OK, I got the point five minutes ago” kind of way. That being said, I was actually amazed at how much more I enjoyed this film than I have previous superhero outings. That’s likely owing to the relationships in Man of Steel. We begin with the backdrop of Krypton and the relationship between Kal-El’s (the future “Clark”) parents Jor-El (Russell Crowe, who was awesome in the movie) and Lara Lor-Van (Ayelet Zurer who is stunningly gorgeous). I don’t want to give anything away, but this film does point in great detail to Superman’s origins, including that “S” symbol. The centrality of family to this film is carried on brilliantly in the scenes with Martha and Jonathan Kent (Diane Lane and Kevin Costner). Jonathan Kent: You’re the answer, son. You’re the answer to “are we alone in the universe”. Clark Kent at 13: Can’t I just… keep pretending I’m your son? Jonathan Kent: You ARE my son. And I have to believe that you were sent here for a reason. And even if it takes the rest of your life, you owe it to yourself to find out what that reason is. We too have a “reason” for being. Like Clark, we owe it to ourselves (and to the God who so lovingly put us here) to figure it out. 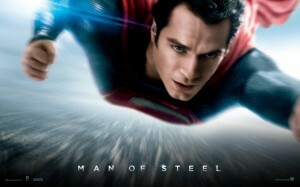 Along with these theological flourishes, “Man of Steel” also includes plot details that touch on real-life moral issues. Thus Zod is committed to a form of eugenics that arose on Krypton in the lead-up to its disintegration. Under this scheme, children were bred to fulfill a predetermined social role and their lives before birth were spent not in their mothers’ wombs, but in an artificial atmosphere within which they were nurtured en masse. Superman’s parents were completely opposed to this system, and saw to it that Superman became the first child on Krypton in many years born in the natural way. Their clashing views on this subject constituted one of the sources of conflict between Zod and Jor-El. How amazing would it be if each of us made it our mission to do just that: to make a better world? We may differ in how we define “better”, but within each of us is the potential to make our own little corners of the world more loving, more caring, more compassionate. And isn’t that what we hope for our children as we send them out to live their lives? For me, it stands to reason that perhaps God could have whispered this very phrase as he knit each of us within our mothers’ wombs. Hope is alive. We can be better, and so can our world.